VANCOUVER, BC – Canadian rockabilly master Cousin Harley is paying homage to influential guitarist, singer, and songwriter Merle Travis in a rollicking new CD, sponsored by Bigsby Guitars & Vibratos, entitled Blue Smoke: The Music of Merle Travis, coming November 25 on Little Pig Records. A special CD release event honoring Travis’ 100th Birthday will be held on the release date in Cousin Harley’s hometown of Vancouver, BC, at The Rickshaw Theatre. 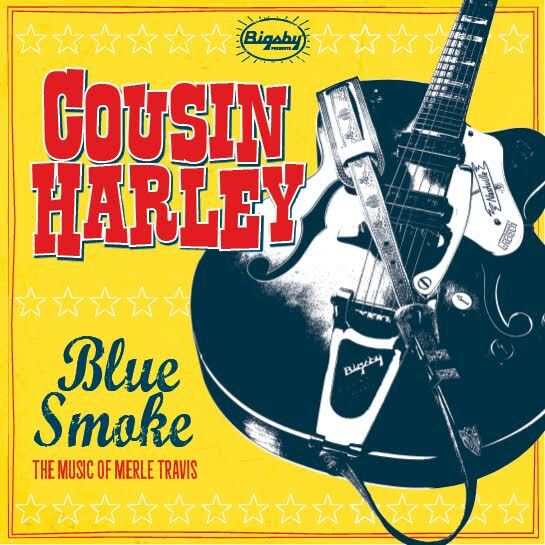 Blue Smoke: The Music of Merle Travis, Cousin Harley’s sixth studio album, was recorded at Heavy-o-Sonic Studio in Vancouver, BC, and features the trio of Paul Pigat – guitar and lead vocals, Keith Picot – upright bass, and Jesse Cahill – drums. Marc L’Esperance engineered the project and also contributed harmony vocals. Cousin Harley’s Travis Tribute CD is sponsored by Bigsby, whose founder, Paul Bigsby, worked with Merle Travis in 1948 to build the first modern solidbody electric guitar. In 1951, Travis challenged Bigsby to design a guitar vibrato unit that would work and keep his guitar in tune. The result was the innovative Bigsby True Vibrato. Pigat, an official Gretsch endorser, primarily used his custom-made, Bigsby-equipped Gretsch Synchro-Club prototype on the CD. Designed with Stephen Stern, the head of the Gretsch Custom Shop, the Synchro-Club is a fusion of a thin-bodied early 60s Gretsch Country Club and a 1939 Gretsch Synchromatic guitar. It features a blonde top, cats-eye soundholes, block inlays, and custom TV Jones pickups. Blue Smoke: The Music of Merle Travis is available from numerous online partners, including iTunes and CD Baby. Cousin Harley is the musical persona of multi-talented guitar slinger, songwriter, and vocalist Paul Pigat. 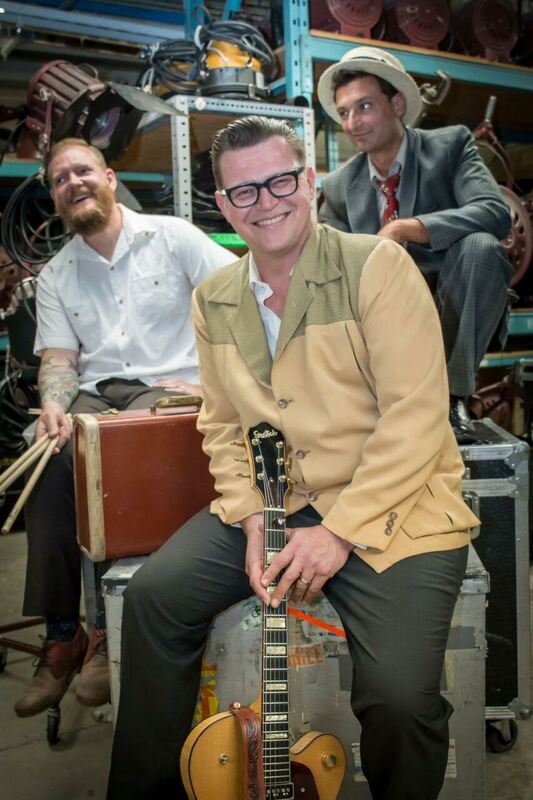 Along with Keith Picot on upright bass and Jesse Cahill on drums, this high-octane Canadian trio has earned the reputation for delivering everything from hot rod rockabilly to foot-stomping honky tonk, vintage country, and western swing music. To learn more about Cousin Harley, visit paulpigat.com. Paul A. Bigsby developed and refined the pedal steel guitar, and in 1948, built the world’s first modern electric solidly guitar for his friend, guitarist Merle Travis. In 1951, Travis challenged Bigsby to build “a vibrato contraption that works.” The result was the ingenious Bigsby True Vibrato, which has enhanced the playing style of guitarists the world over and can be heard on recordings in almost every genre – from punk to folk, and country to rock. Bigsby Vibratos have been featured continuously on Gretsch guitars since 1955, and the Gretsch Company purchased Bigsby in 1999 from then-owner Ted McCarty. To learn more about Bigsby, visit bigsby.com.